US, 1957, 75 minutes, Black-and-white. John Lund, Doris Singleton, John Archer, Angela Greene, Alan Hale Jr, Richard Deacon, Thurston Hall. Everybody knows that Reno is the place for quick divorces. This has been the situation for decades. 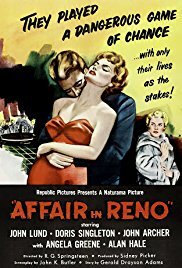 This light, rather fluffy film, even though it involves gambling and gangsters, starts with Bill Carter, John Lund, flying to Reno, stitching 800 thousand dollars in cash into his coat shoulder pads. He has been commissioned by a wealthy New Yorker to intervene in the marriage of his daughter to the local gangster, to pay him off and bring the daughter home. Almost immediately, Carter is attacked for the money by the gangsters’ henchman. He phones the wealthy New Yorker and is promised a bodyguard. And this is where the film changes tone and becomes more enjoyable than it might have been – and is an interesting example of the role of a woman in a man’s job in a film of this period. John Archer is the villain, Alan Hale Jr is one of his toughs. The action takes place in the hotel room with a kind of It Happened One Night separation, in the club, out on the roads. It is over to the bodyguard to get all the information, find the address and meet with the heiress, rescue Carter when he has been abandoned out in the Nevada desert, persuade the heiress of the truth, and save the money in the casino. The film was directed by R.G.Springsteen, a regular with this kind of supporting feature. The film shows what a woman can do – and what even a genial man cannot do!